Pond kits help take the guesswork out of building your own water feature. All the right components have been carefully sized and selected for you. You don’t have to worry about choosing incompatible items or forgetting an important part that will hold up the completion of your project. All you need to do is add rocks, plants, water, fish and some imagination! 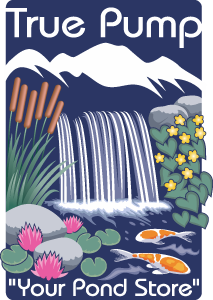 Pond kits are available for Ecosystem Ponds, Pondless® Waterfalls and Garden Fountains. Ecosystem Pond kits provide a natural, easy to install, low maintenance, beautiful investment for any home or property. An Ecosystem Pond consists of a biological filter and skimmer which combine to form a unique filtration system. Other necessary components are pond liner and underlayment, a re-circulating pump and plumbing, rocks and gravel, aquatic plants, fish and beneficial bacteria. All these elements are necessary to achieve a crystal clear, naturally balanced pond. Aquascape’s 20 step process will guide you through the installation and setup of a complete Ecosystem Pond. A Pondless® Waterfall kit allows you to experience the soothing sights and sounds of moving water with less maintenance and expense than the Ecosystem Pond. A Pondless® Waterfall is often the perfect water feature for front yards, smaller spaces, public areas or homes with small children. In a Pondless® Waterfall the pond and skimmer are replaced by a lined storage basin containing rock and a pump vault. This basin stores the necessary water required to operate the stream and waterfalls, yet no water is visible at the basin’s surface. An up-flow filter is still used at the top of the system which acts as a reservoir and a source to begin the stream and waterfalls. Garden Fountain kits provide you with a unique and creative way to decorate your landscape and outdoor living space. The soothing sights and sounds of running water are incredibly relaxing and add interest to your landscape (and indoor spaces too). Many homeowners desire a water feature but may not be ready for an Ecosystem Pond or Pondless® Waterfall, don’t have room for these types of features or they may not fit into your budget. Your garden fountain may consist of a bubbling urn, a statuary piece or other decorative item, natural or carved stone or a small container water garden. Garden Fountains can be designed to fit almost any space or budget! 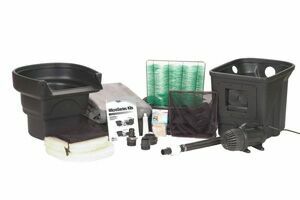 True Pump carries a wide variety of pre-packaged and customizable pond kits so you can create your own unique Ecosystem Pond, Pondless® Waterfall or Garden Fountain.